Google Maps is finally starting to understand the headache that is parking. Earlier this year it added a parking availability feature that let you know how hard it would be to find a spot at your destination, but the latest addition to the Maps beta is one we’ve been waiting years for. 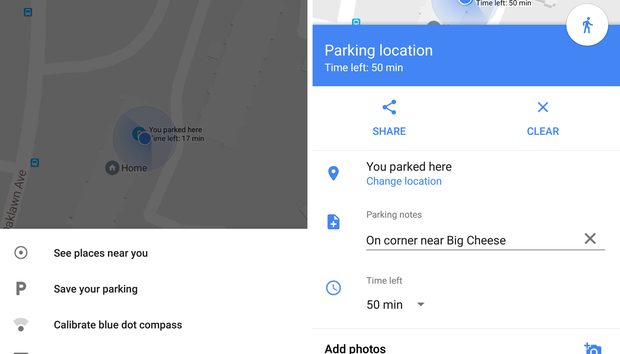 Google has long offered a parking reminder card in Google Now, but it’s always been kind of flaky (and never really belonged there). With the latest Maps beta, Google is giving it a new home. First spotted by Android Police, when you tap the blue location dot on the map you’ll see a new Save your parking option, which will let you chart your position right inside Maps. The beta also includes a new weather indicator for transit directions and an updated arrival screen for Android Auto users. Additionally, Android Police found a reference to a new sorting tool for searches when conducting its customary teardown. You can sign up to be a Maps beta tester in the Play Store or you can side-load the Google-signed APK from APKMirror. The impact on you on the road: This is one of the most overdue features in Google Maps, so much so that even Apple has had it in its far inferior Maps app for w while. We don’t know why it took Google so long to add it, but we just hope the beta testing is quick.